Are you a coffee lover who loves peanut butter? Then, this is the cupcake for you. Here is the recipe for peanut butter coffee cupcake. Preheat oven at 170° C. Arrange paper cupcake cases on a baking tray. Sift superfine and plain flours together. Combine coffee powder and fresh milk. Combine butter, sugar, coffee milk mixture, flour and egg in a mixing bowl. Beat until smooth. Stir in peanut butter and chopped walnuts. Mix until well combined. Spoon batter into paper-cup cases. Bake for 20-25 minutes. Remove cakes from oven and cool on wire racks. Beat cream well, icing sugar and peanut butter until light and fluffy. Pipe on top of each cupcake. 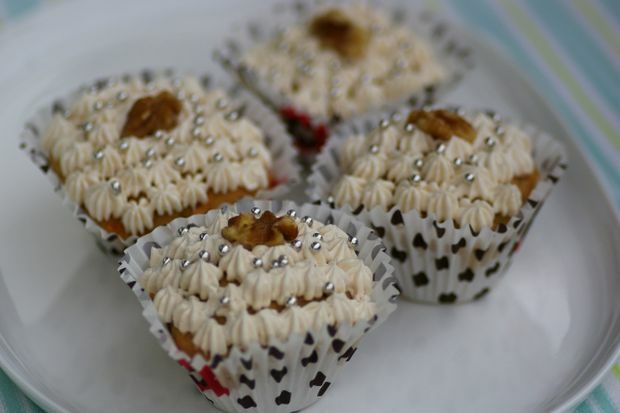 Sprinkle with silver dragees and top with a toasted walnut.